Why No Bhine (Why No Goodbye) cover rendering. Art by Bashar Ericsoossi. Pamela Laskin, a lecturer in the English Department at The City College of New York, is one of two winners of Leapfrog Fiction's International Contest for 2018 for her book, Why No Bhine (Why No Goodbye), a young adult novel in verse. The story is told from the point of view of a fourteen-year-old boy who has been left behind in Myanmar when his mother and three of his siblings escaped to Malaysia. 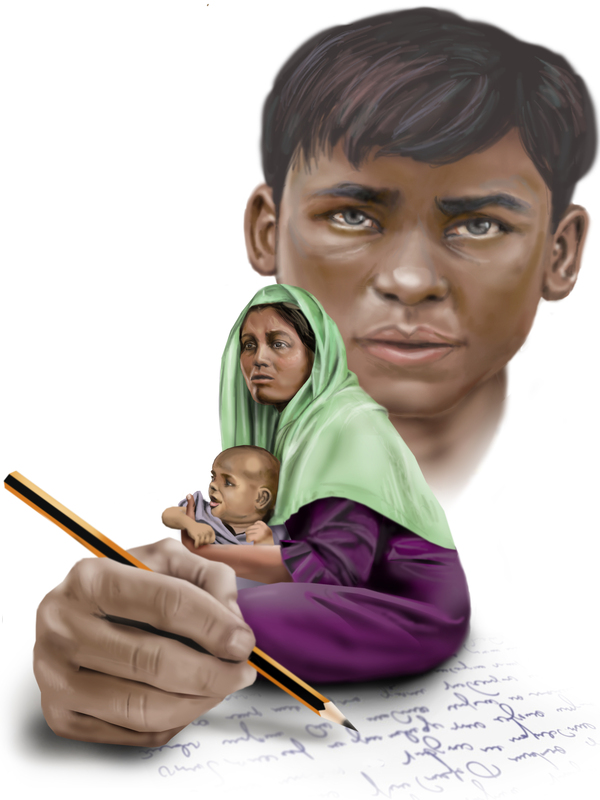 The boy, Jubair, writes angry letters to his mother, which she will never get to see. Meanwhile, his mother manages to smuggle letters to him, but he never reads them; he is too enraged over what he perceives to be his abandonment. The Rohingya Muslims, around whom the novel unfolds, are the target of intense racial profiling, political persecution and genocide. Laskin has worked closely with Fortify Rights, a human rights organization in that regional area whose explicit mission is the protection of Rohingya citizens. The book will be published in Fall 2019 by Leapfrog Press, a New York based imprint founded by the authors Marge Piercy and Ira Wood. Laskin also directs CCNY’s Poetry Outreach Center and teaches Children’s Writing in the MFA Division. She is the author of five books of poetry, several picture books, and the lyrical novel Ronit & Jamil, a Palestinian/Israeli reimagining of Romeo and Juliet.